We traveled around the world to Beijing to brand China’s newest craft brewery, Prodigy Brewing. See how we bridged the cultural gap to create a beautiful identity and packaging. This piece was originally published on CODO’s blog. Check it out to see more deep dives and behind-the-scenes looks at brewery branding projects across the United States and around the world. If craft beer in America hasn’t reached a saturation point, it’s getting close. This is a bit anecdotal, but the people I look to for beer news, my most ardent beer geek friends, have stopped following local openings, news and festivals — there’s just so much beer flowing today that it’s hard to keep up any more. But as we increasingly work with breweries outside of the United States, in places like Australia, Amsterdam, Scotland, Mexico and Argentina, we realize that there’s an entire other world out there welcoming beautifully made craft beer into their lives with open arms. And there’s an army of young brewers lining up to meet this demand and follow the lead of the American craft pioneers that came before them. Out of all the emerging craft beer markets around the world, none present such an enticing opportunity as China. Some context for you: there are now more than 300 breweries in China, more than double from just a few years ago. And with more than a billion people in the country, it represents a big enough opportunity that AB InBev has weighed in with a major brewery purchase (Boxing Cat). While many Chinese craft beers are made with local ingredients like chrysanthemum, Oolang tea, and Sichuan peppercorns, you’re just as likely to come across familiar American staples like IPAs, porters, stouts and even some of the trendier styles you’re seeing here in the United States — Hazy IPAs, barrel-aged programs and Brett experiments. The Chinese craft market is comprised of a small, but growing group of successful breweries. Many of these are American-owned. When we were first approached by Prodigy Brewing, an upstart craft brewery in Beijing, we were excited and a bit nervous. While we’ve worked with several international breweries, China presents an entirely different language and culture with very little carryover from the States. And making this a more damning challenge was that there was no plan for travel. We would be working remotely with a team of Americans and Chinese folks who live in Beijing, and were banking on the fact that we had boots on the ground in China that could give us guidance as we made our way through the branding process. We kick off our brand strategy process with goal definition, framing compelling messaging, positioning, audience, differentiators, and brand essence. In this case, we were also attempting to define the Chinese craft beer drinker. We talked to Prodigy’s owners, the brewing team, and the Chinese partners. We conducted a competitive analysis of the major craft breweries in Beijing, and we worked to define what the idea of a Prodigy meant in a craft beer context to a Chinese craft beer drinker. Big ideas and communication pillars that emerged early in the process were Education, Pedigree, Quality (still a differentiator in China), and the hard-to-pin-down idea of blending American and Chinese aesthetics (without being tone deaf). Quick crash course: Chinese folks value pedigree and class. One of Prodigy’s founders is an American professor, so at this point, we’re planning to lean into this. And interestingly, whereas Americans revere and pay a premium for American-made products, the average Chinese person does not share the same sentiment for local, Chinese-made products. They view Chinese-made products the same way most Americans do — suspect quality. Working as closely as we could with the Prodigy team, we began sketching brand identity options to see what this could all look like. Through this process, we arrived at two directions. The first direction focused on a crane—a revered symbol in Chinese mythology that represents longevity and wisdom. While contemporary in line weight, we had some wiggle room as to whether it looked old or new through color. The second direction was a literal combination of Chinese and American craft beer aesthetics. The four Chinese characters nested perfectly within big, friendly English typography. Color and and pattering would round out the system. We were proud of where we arrived and the Prodigy team loved both directions. But then we hit a snag. After sharing our initial branding concepts with the Stateside Prodigy team, they shared the work with their community in China (comprised of home brewers, beer geeks, bar owners, and distributors). This round of critique brought up a frustrating and humbling issue; what we had made looked Japanese. Not overly Japanese, but enough that it would immediately stand out to a Chinese beer drinker. Turns out, a lot is lost in translation when you’re unable to experience something as foreign as China firsthand. After sorting out Visa applications and a whirlwind itinerary, our bags were packed and we were ready to go. One 24-hour layover in California (which allowed us to visit our friends at Seven Cities Bev Co.) and a thirteen-hour flight later, and we landed in Beijing. Jetlagged and weary, we immediately met with the Prodigy team, including a gentleman named “Tiger.” Tiger is in his early thirties, boasts 27 stab wounds (scars, technically), carries two phones — “one for business and one for pleasure,” and loves Katy Perry. We knew right away that we were in good hands. Our team assembled, we set out for drinks, food, and more drinks. We hit up a few prominent craft breweries in downtown Beijing—Jing A, Slow Boat, and Great Leap, and soaked up as much of the local night life as we could. It was interesting calling out the same trends and tropes we see in American craft beer. Besides the too-familiar exposed brick, hanging Edison bulbs and subway tile, you’ve got your dyed in the wool “Hipster Brewery,” your “Dad Brewery,” and the venerable “OG Craft Brewery” that makes amazing beer but is now looked upon as the Establishment (despite the fact that they pioneered local craft beer). Perhaps one of America’s biggest exports is cynicism? Jing A Brewing (left), Slow Boat Brewery (center), and Great Leap Brewing (right). The next day, or night — at this point, it’s all a blur — we took a two-hour bullet train to the contract brewery in Handan. Their facility was fascinating, if not surreal — it’s a German brewery in China. We had traveled from America to China and then suddenly found ourselves in German brewery. Chinese regulations prevent you from operating your own brewery unless you’re capable of producing 12,000 or more bottles per hour. This causes many of the craft brands to rely on this particular contract brewer. After touring their entire operation, we ended the visit with lunch and some fantastic beer in their brewpub. Handan train station (left), visiting the contract brewery (right). Afterwards we made our way back to the train station and headed back to Beijing. But our night wasn’t over yet. After a meal of hot soup where we ate pig brains, pig blood, and cow stomach (a first for me), we decided to visit Great Leap’s Hutong brewery. The Hutong are nearly thousand year old neighborhoods comprised of alleyways and courtyard homes. Hole-in-the-wall doesn’t do this bar justice; it’s more like a hole in a wall in a maze. However, once inside, we felt like we were back in the States. This place could easily pass for a Brooklyn dive bar. Cow stomach and pig brain (top left), Hutong location of Great Leap Brewing (bottom left, right). This night started out productive. But after a beer, and then another, and another, and another, and another… for those who are questioning the necessity of trips and nights like these — whether we’re winding our way through Sioux Falls, South Dakota, or spending a week in Beijing, you often get the most color on a project and a community and the opportunities therein by immersing yourself with the locals. This entire day and night were spent discussing politics, pop culture, and the interesting intersection of American and Chinese craft beer. The following morning was a bit hairy, but we persevered and all agreed to do something touristy. I generally avoid stuff like this, but after seeing the Great Wall in person, I may set those reservations aside more often. This beautiful, rural setting created an abrupt, and welcome, contrast from the fast moving and overwhelming urban scenes we’d spent the last few days experiencing. Mutianyu section of the Great Wall looking west (left) and looking east (right). We spent our last evening at the British-owned, hipster-friendly Arrow Factory Brewing. This place definitely had a cool-yet-fun vibe with a distressed interior and large posters of their labels (solid branding and great beer). It was a nice end to our Beijing craft beer tour, and the next morning found us headed home on another thirteen hour flight. Arrow Factory Brewing (left, center), Beijing airport customs (right). Now we’re back in lovely Indiana (no cow lung or pig brain entrées in sight). After a few days to decompress, we’re able to sit down and formalize what this should all look and feel like, and where we had gone wrong the first time around. Working with the Prodigy team, we began to define anew their audience, brand essence and what positioning and messaging we needed to explore. The answer; American Craft Beer. You read that correctly — we had to travel nearly 7,000 miles around the world to realize that the Chinese craft beer consumer wants a Western-made beer brand. Or at least, a craft beer that has some semblance of America. We had to leave home and see one of the most beautiful places we’ve ever experienced to see that it had to look somewhat familiar to what we’ve seen over the last 8+ years of working in this industry. This insight in hand, we built out a brand identity that looked vaguely American, while retaining key pieces that would resonate with folks in China. The main icon was inspired by ribbons (a reference to academia; red ribbons are often used in China as a good luck charm), and a combination of the letter ‘P’ and the lucky numeral ‘8.’ The icon is set atop a bottle cap seal (combining academic and beer references). The color palette has a warm, nostalgic feel that has been a staple American craft beer aesthetic for years. Finally, we rounded out the identity with rule lines, grid lines and hand-drawn elements to further reference academia and expertise. 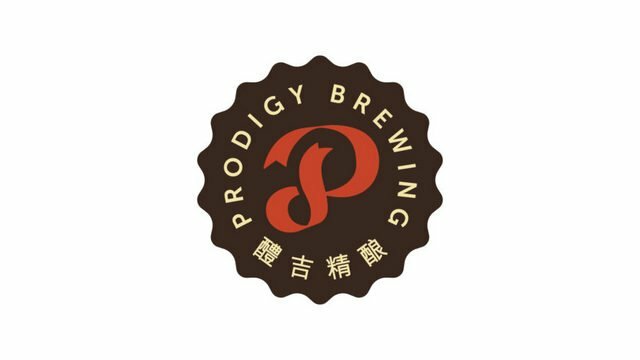 This spoke to the original brand essence and positioning of Prodigy as the intelligent craft beer choice or an enlightened, American craft beer academic who’s fallen in love with China and its culture. 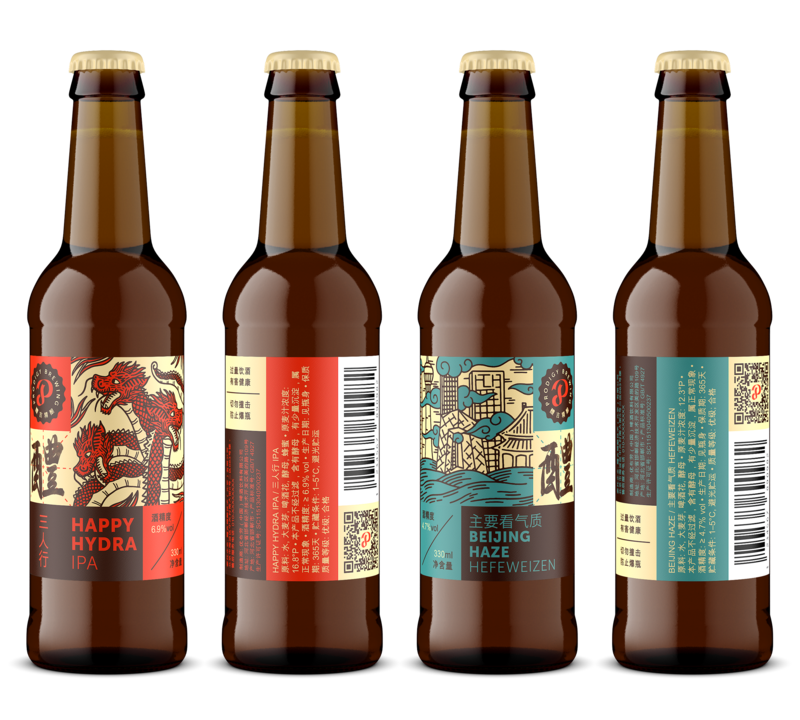 With the identity wrapped, we went on to illustrate and design Prodigy’s two flagship beers — Happy Hydra IPA and Beijing Haze (a Hefe). Beijing Haze Hefeweizen (4.7 percent) is inspired by lazy summer days in the mountains or by a lake. Brewed to Reinheitsgebot standards, this refreshing wheat ale is lightly hopped with a fruity aroma and hints of banana and crisp apple. Happy Hydra IPA (6.9 percent) is brewed with a cascade, centennial, and columbus hops to deliver a bold, balanced and hoppy beer. Could our first Chinese project have gone a bit smoother? Sure. Could it have turned out any better than it did? I don’t think so. Flying over to Beijing and experiencing the city and its eccentric, welcoming people firsthand was an amazing opportunity that immediately let us know how to tell the Prodigy story. It’s been fun watching the rest of the world embrace craft beer, and we’re honored to have played a small part in adding one more to the mix in China. We’ve got a few more opportunities over there already and are eagerly cheering on the movement one pint at a time.